News in brief from the NFC world and beyond: NXP CEO picks NFC • Nacha cuts out cards • P2P payments set for growth • Bharti Airtel picks up payments license • Facebook Deals a blow • Only 4% have checked out checking in. 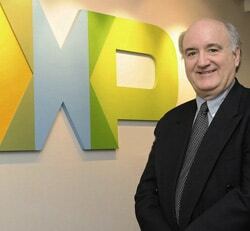 NXP CEO PICKS NFC: Chief executive Rick Clemmer has highlighted NFC as one of the technologies that will drive NXP‘s growth in 2011. Speaking after NXP had announced its financial results for the third quarter, Clemmer said that “the deployment of near field communications (NFC) is smartphones and the use of compact fluorescent lamps (CFL) as replacements for incandescent bulbs were two applications that would drive demand in 2011”, EE Times reports. “The ramp associated with NFC in smartphones and CFL [compact fluorescent tubes] driver ICs is something we expect in the spring of 2011,” Clemmer explained. BHARTI AIRTEL PICKS UP PAYMENTS LICENSE: Indian mobile network operator Bharti Airtel has become the first operator in the country to be granted a payments licence by the Reserve Bank of India. “Bharti Airtel was granted the licence to use the Semi Closed Wallet by the RBI in this quarter, Times of India reports. “This allows a customer to exchange physical cash for virtual money which can be stored on mobile phone to pay for goods/services for transaction of value less than Rs 5,000.” The operator has also announced it is to introduce a range of own-label handsets for the first time. FACEBOOK DEALS A BLOW: Social networking giant Facebook has dealt a major blow to the revenue aspirations of location-based advertising providers. The company’s new Facebook Deals allows any business to post rewards that Facebook Places users can instantly redeem at a local outlet— free of charge. Businesses offering a reward to Facebook Places users will also be rewarded by being highlighted in yellow in results pages. Gap, H&M, McDonald’s, Starbucks, Macy’s and the San Francisco 49ers have already signed up for the service. LATE CHECK-IN: Despite their high profile, only 4% of online Americans have so far used a check-in service such as Foursquare or Gowalla to share their location with friends and to find others who are nearby, according to research conducted by the Pew Research Center.